In a bid to ease abduction and killing of persons with albinism and other criminal cases, police have requested people from Chigodi Village, Traditional Authority (TA) Chakhumbira in Ntcheu to offer land for construction of a police unit. 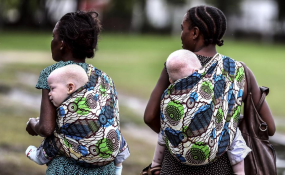 Central Region Commissioner of police, Evalista Chisale made the request on Thursday during a sensitization meeting on the abduction and killing of people with albinism at Chigodi primary school in the district. The Police commissioner said lack of structures to carter for police officers in areas nearby Chigodi village, TA Chakhumbira promotes criminal cases that lead to unsafe community for people with albinism and other people. "When the community members provide us a place to construct a police unit and staff houses, it will be easy for us to send them police officers to deliver services to them immediately," she assured. She added that as police, their duty is to protect civilians and make sure that there is peace and order in the country. In a separate interview, Chairperson for Association of Persons with Albinism in Ntcheu, Precious Kapenuka concurred with the commissioner saying their areas are insecure more especially for them because of the lack of security personnel. "In Ntcheu district, we registered 185 persons with albinos, with 14 people in Chigodi area alone. We walk long distances to access and report cases that affect us to our nearest police stations such as Ntcheu and Golomoti among others which are far from Chigodi area," he said. On May 20, 2016, in the same village, Fletcher Masina 46, a person with albinism was killed during rainy season by perpetrators of the vice. It is therefore envisaged that the coming in of a police unit would boost security of the general public in the area. Kapenuka requested government and all development partners to construct a police unit in Chigodi village to ease criminal cases of abduction and killing of people with albinism. Traditional Authority (TA) Chakhumbira said through community policing programs in their areas they are able to identify safety and security problems and come up with solutions together with the public. "Community involvement is not meaningful if partnership and organizational transformation are not contributing to the satisfaction of the community needs," he said. During the event the commissioner also donated sunscreen lotions to people with albinism to help them in skin protection.